At Saints Peter& Paul School (of Grangeville) we learn our faith and put our faith into action regarding helping others in need. Our local food bank receives donations collected at school dances several times a year. The school also sponsors annual drives for Catholic Relief Services “Rice Bowl” program; the Leukemia Foundation’s “Pennies for Patients”; Saint Jude Research Hospital’s “Math-a-Thon,”and for our local Hope Pregnancy Center. We also have sponsored students in Guatemala for several decades, contributing through our Friday Mass collection. How do students in the wealthy country in which we live understand and relate to students in one of the poorest countries in the world? One way in which we learn to understand is through our World Hunger Day. World Hunger Day is a yearly tradition at SPPS at which students learn about world hunger by being divided into three groups, which correspond to the percent of the world’s countries and their economic status. --Thirty percent of the students represent developed world countries and are fed just a burger patty, some vegetables and milk. --Sixty percent represent the world’s developing countries and are fed only a small bowl of rice. For World Hunger Day our guest speaker, Mark Frei, spoke about the time he spent in Guatemala. He presented a slide show so that we could see the homes, the clothing, the clean water challenges and more in Guatemala. He inspired us to be thankful for all our blessings, to develop our spirit of generosity, and to have a new view of our possessions. The students gained a greater understanding about what it would be like to live in a country like Guatemala and how blessed we are to live in the United States of America. Students are expected to appreciate, respect and have compassion for others. To foster these ideals, each classroom is required to perform one community service activity each quarter. These activities have included canned food drives, raising money for the Pregnancy Center, raking leaves and shoveling snow for the elderly, raising & sending money to a less developed country to buy goats & chickens, and putting together and mailing Christmas shoe boxes of gifts and necessities to those less fortunate. For more than twenty years, Sts. Peter & Paul School students have sponsored children in poorer countries through the Christian Foundation for Children & Adults. For several decades, we have sponsored children from Guatamala and students were advised of the monthly cost of their support. Students are asked to generously give their money (not their parents') and a collection is taken at Mass each Friday. "I appreciate and am impressed by the charity and compassion of our students." World Hunger Day is a yearly tradition at SPPS. On this day students learn about world hunger by being divided into 3 groups, which correspond to the percent of the world's countries and their economic status. Ten percent of students represent the advanced developed countries of the world and are fed a banquet with burgers, fries, vegetables and dessert. Thirty percent of the students represent developed world countries and are fed adequately with a meat patty and vegetables. Sixty percent represent the world's developing countries and are fed a a small bowl of rice. The students are fed only what is listed however after lunch recess the rice students are offered an uncrustable sandwich and banana. Students and staff are chosen by luck of the draw. Most students will experience being hungry. We invite a different speaker each year to talk to the students about hunger. Students in the picture represent the 60% of people living in developing countries. They are eating a small bowl of rice while being seated on the floor. "I appreciate the speakers our school has secured to talk to the students during the Hunger Banquet. In the past, we've heard from Fr. John who spoke about hunger in Kenya and a Food Bank representative came to speak about the hunger issues in Grangeville. This year, Aggie Haener talked to the children about being a child during the Depression and having to do without." Operation Rice Bowl is a lenten program, began in 1975, as a response to the drought in the African Sahel. For more than 35 years, Operation Rice Bowl has offered Catholics in the United States a way to connect with our brothers and sisters in need around the world. Each Lent, nearly 13,000 faith communities across the United States participate to demonstrate solidarity with the poor around the world. Seventy-five percent of Operation Rice Bowl donations come to Catholic Relief Services to help fund development programs designed to increase food security around the world. Twenty-five percent of the donations support hunger and poverty alleviation efforts within the United States. 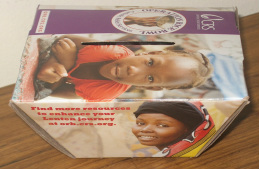 Our students are given small cardboard boxes which resemble rice bowls at the beginning of Lent and any donations they wish to place in their "rice bowls" to help Catholic Relief Charities fight world hunger are appreciated.